Internet Explorer 8 released but.. I was heading to my work but before that, instinctively checked some news and read Microsoft released their much expected IE8. They cut off their 'beta' tag off it. Way to work, I was thinking about it's features. Back to home in the evening,I opened up my VMware(sandbox for me), I fired up the firefox and downloaded IE8. It looked very beautiful and installation required me to reboot. 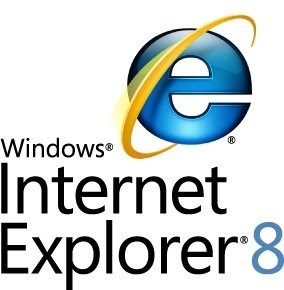 I was in an ecstasy to ditch firefox and carry on with Microsoft's latest IE8. They have this new features like Search Suggestions which retrieve information as we type,another feature called accelerators let us preview online services just by pointing mouse at them,another feature called suggested Sites which is discover websites based on websites visited and lot others focused on security issues. As I went with surfing sites, it felt pretty cool, I checked their other submenus under Tools menu and things that they've changed, to be true, all the ideas seemed borrowed from here and there. They've got this 'developers tool' integrated which lets your check the site's core. Some sites including mine were rendered very badly. I found that the script used on my site is not complaint with IE8 standard and they're very unforgiving at showing pages like that. As soon as I loaded my page, IE8 got crashed. IE7 shows my site without any error. Even if it(IE7) shows some other sites with error, it wouldn't crash. IE8 needs to be lenient when it comes to tolerate minor script errors. Nah, it's not, IE8 is strict about being perfect. All the features, that I've seen on firefox and chrome can be seen in IE8. Nothing much of difference to me except few. I'll stick to firefox and chrome.